Last week, more than 25 Democratic legislative leaders from Palm Beach County and the state announced endorsing state Rep. Lori Berman in her bid for Senate District 31. Among those lining up behind Berman, a Lantana Democrat who represents HD 90, are Congressman Ted Deutch of Florida’s 22nd Congressional District, former Congressmen Patrick Murphy and Robert Wexler, both Democratic Palm Beach County Sens. Kevin Rader and Bobby Powell, Sens. Linda Stewart, Annette Taddeo and Victor Torres. State Representatives endorsing Berman include House Democratic Leader Janet Cruz, House Democratic Leader Designate Kionne McGhee, House Democratic Policy Chairs Evan Jenne and Cynthia Stafford, Democratic Leader Pro Tempore Bobby DuBose, Reps. Matt Willhite, Robert Asencio, Loranne Ausley, Kamia Brown, John Cortes, Tracie Davis, Ben Diamond, Joseph Geller, Patrick Henry, Shevrin Jones, Amy Mercado, Barrington Russell, Sean Shaw, Carlos Guillermo Smith, Richard Stark, Barbara Watson and Wengay “Newt” Newton. “Lori Berman is the only choice for true Democrats in the race for state Senate, and that is why so many outstanding elected officials have come out and endorsed her today,” said Rader. Berman is resigning her House seat effective April 9 of next year for the SD 31 special election, which covers Lake Worth, Boynton Beach, Delray Beach and Greenacres. The seat vacated after POLITICO Florida reported on an extramarital affair between then-Democratic Sen. Jeff Clemens and Tallahassee lobbyist Devon West. Clemens resigned the seat. Lantana Democratic Rep. Lori Berman announced Tuesday she will run for the special election in Senate District 31, which opened up Friday following the unexpected and immediate resignation of Jeff Clemens. Berman also took a jab at the Republican-controlled Legislature, which she said has caused suffering among Florida children and seniors. Although her message calling for more strong women in the Senate will likely resonate more within the safe Democratic district, especially given the nature of Clemens’ exit from the Legislature and the focus laid upon sexual harassment in both Tallahassee and the nation over the past month. Clemens, a Fort Worth Democrat who was slated to become Senate Minority Leader, stepped down Friday after reports surfaced of an affair he had with lobbyist Devon West. The tryst took place during the 2017 Legislative Session and boiled over when West got ahold of Clemens’ laptop and informed his wife of the affair. “I have made mistakes I’m ashamed of, and for the past six months I have been focused on becoming a better person,” he said in a statement to the media last week. “All women deserve respect, and by my actions, I feel I have failed that standard. I have to do better.”Berman follows former Democratic Rep. Irv Slosberg in announcing her candidacy, though more Democrats are expected to throw their hats in the ring in the coming days. Among those speculated to join her are Democratic Rep. David Silvers and Delray Beach Mayor Cary Glickstein. SD 31 covers part of coastal Palm Beach County, including Lake Worth, Lantana, Boynton Beach and Delray Beach. Gov. Rick Scott has not yet set dates for the special election, though Palm Beach County Elections Supervisor Susan Bucher proposed Monday that a primary election be held Jan. 30, followed by an April 10 general election. 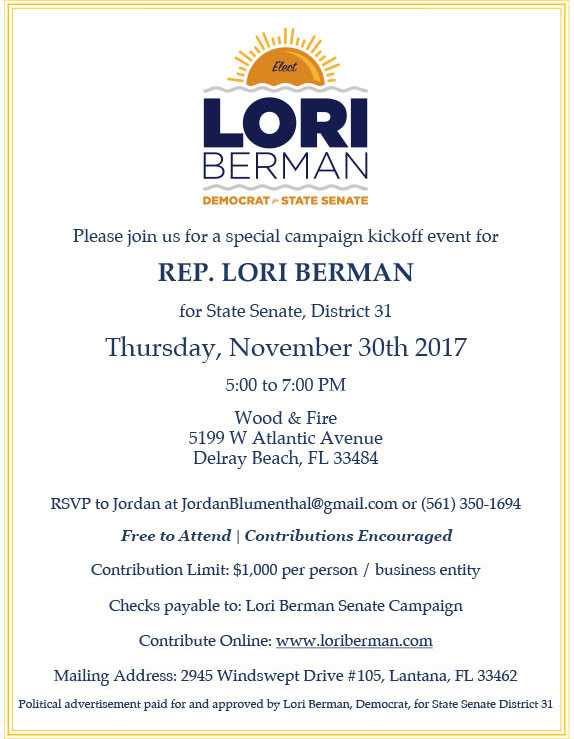 https://loriberman.com/wp-content/uploads/2017/11/Berman_Branding_StateSenate.gif 0 0 mdwcomm https://loriberman.com/wp-content/uploads/2017/11/Berman_Branding_StateSenate.gif mdwcomm2017-10-31 22:06:412017-11-30 22:07:41Florida Politics: "Lori Berman to run in SD 31 special election"
TALLAHASSEE — With Congress showing no signs of breaking its long deadlock over funding to fight the Zika virus, Florida lawmakers Wednesday threw in behind a new weapon — Franken-skeeters. 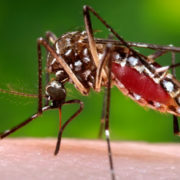 A majority of Florida House members asked federal health officials to approve releasing genetically modified mosquitoes in the state to reduce the risk of more cases of the Zika virus. Florida has already reported more than 700 cases, including 56 that could be linked to local mosquitoes. Led by Incoming House Speaker Richard Corcoran, R-Land O’ Lakes, and Rep. Janet Cruz, D-Tampa, who becomes her party’s House leader after the November elections, 61 House members sent a letter to U.S. Health and Human Services Secretary Sylvia Burwell requesting emergency action to fast-track the modified insects with the colorful nickname. “We must find and utilize new strategies to both curb the spread of the virus and prevent additional outbreaks,” the Florida leaders wrote. Palm Beach County Reps. MaryLynn Magar, R-Tequesta, Bill Hager, R-Delray Beach, Rep. Lori Berman, D-Lantana, and Kevin Rader, D-Delray Beach, were among those signing. The British company Oxitec has developed technology to mutate millions of Aedes aegypti mosquitoes in a lab setting, deploying a synthetic protein that kills their offspring before they can emerge from larvae as adults and transmit the Zika virus. Last month, Oxitec received a federal go-ahead for a pilot project in the Florida Keys. If wild female mosquitoes mate with sterile males, the population dies off rapidly. The approach has been used in Brazil and Caribbean islands with some success, but questions remain about whether it would make much difference in Florida. Mosquito populations would have to be narrowly targeted, and a large metropolitan area like Miami could prove a challenge, officials have said. “If the federal government follows its normal bureaucratic processes, it might take years for Florida to access this technology. Such a delay presents an unnecessary health risk to the people of our state. Red tape is never an acceptable justification for the loss of human life,” the Florida lawmakers wrote. The letter was sent as the U.S. Senate — just back from a two-month recess — defaulted to what has been its familiar position of deadlocking over Zika funding. A $1.1 billion proposal failed Tuesday in a 52-46 vote after Republican leaders included a provision dropping Planned Parenthood from the list of providers getting new funding to combat the spread of the virus, which can be sexually transmitted. Democrats wouldn’t go along with the move against Planned Parenthood. Florida Republican Sen. Marco Rubio voted for the measure, while the state’s other senator, Democrat Bill Nelson, voted against it. Rubio, who is running for re-election, has said that he would support the entire $1.9 billion Zika funding package proposed in February by President Obama — but not taken up by the GOP-controlled Congress. Rubio’s opponent, U.S. Rep. Patrick Murphy, D-Jupiter, has ridiculed him for failing to get those in his own party to drop their stand against Planned Parenthood. While many Florida members of Congress have clamored for action, Rep. David Jolly, R-Belleair Bluffs, underscored the push Wednesday by bringing a jar with about 100 mosquitoes to the House floor, warning that the University of South Florida needs funding to continue research into the virus. https://loriberman.com/wp-content/uploads/2016/09/stopmosquitoes_456px.jpg 294 456 mdwcomm https://loriberman.com/wp-content/uploads/2017/11/Berman_Branding_StateSenate.gif mdwcomm2016-09-14 22:08:252017-11-29 19:40:11Palm Beach Post: "Florida lawmakers call for genetically modified mosquitoes"
Primary-election voters Tuesday approved the expansion of a renewable-energy tax break that backers say will help businesses and spark the expanded use of solar energy in Florida. But while the measure had support from an array of groups, they are divided on an unrelated solar amendment on the November general-election ballot that could lead to a major political fight. The proposed constitutional amendment approved Tuesday was known as Amendment 4 and was placed on the ballot by the Legislature. It is designed to extend a residential renewable-energy tax break to commercial and industrial properties. Shortly after the polls closed, the measure was more than 10 percentage points above the required 60 percent threshold needed for approval of constitutional amendments. The preliminary results indicated that the measure, which backers say will spur growth in solar and renewable energy, was supported in almost every county. “The strong showing of support for Amendment 4 sends a clear message to elected officials at all levels of government that Florida voters want more diversity in our energy market,” said Sen. Jeff Brandes, a St. Petersburg Republican who sponsored the proposal during the 2016 legislative session. Though approved by voters, the measure still needs the Legislature to enact the changes. The measure — sponsored in the House by Rep. Ray Rodrigues, R-Estero, and Rep. Lori Berman, D-Lantana — will exempt for 20 years the assessed value of solar and renewable-energy devices installed on businesses and industrial properties. “Eliminating high tax barriers will unleash the potential of the ‘Sunshine State’ to become a leader in solar energy production,” Rodrigues said in a prepared statement. Voters approved a similar exemption for residential property owners in 2008, with the measure taking effect in 2014. The new proposal also has an element to help residential property owners, as it would exempt all renewable-energy equipment from state tangible personal property taxes. Support for the measure came from a wide range of organizations such as the Florida Retail Federation, the Florida Restaurant & Lodging Association, the Florida Petroleum Marketers and Convenience Store Association, the Florida AFL-CIO, the Nature Conservancy, the Sierra Club of Florida and Surfrider Foundation. A poll released last week by the Florida Chamber of Commerce showed 70 percent of Floridians supported the proposal, with 14 percent opposed. Yet on Friday Mason-Dixon Polling & Research released findings that indicated the measure was having serious trouble with Republicans and independent voters. Some late opposition to the measure came from groups such as the Orlando-based political action committees Stop Playing Favorites and the Advocacy, Action & Accountability Alliance, which claimed the amendment would provide “millions in tax breaks to big corporations” at the expense of money that would otherwise flow into minority communities. Backers of the measure also had to overcome some confusion that the proposal was linked to a separate utility-backed solar proposal on the November ballot. With Tuesday’s victory, supporters of Amendment 4 are now expected to divide up on what is known as Amendment 1 in November. Stephen Smith, executive director of the Southern Alliance for Clean Energy, said his group is ready to immediately “pivot” from having supported Amendment 4 to vocally opposing Amendment 1. 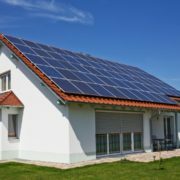 The November “Consumers for Smart Solar” initiative would generally maintain the status quo in allowing Floridians with solar equipment on their property to sell energy to power companies. More than $15 million has already been spent promoting the November amendment. The three legislators responsible for a statewide initiative concerning home and industrial solar power system tax breaks announced on Tuesday they’ll be launching a campaign to get the measure passed on the August ballot. The amendment would essentially be a tax break: It would exempt solar power equipment on homes from being counted toward a house’s value for property tax purposes. It also would exempt from taxation solar energy devices on commercial and industrial properties. Berman and Fort Myers Republican Ray Rodrigues sponsored the measure in the House, where it passed unanimously. Brandes initially proposed the solar amendment in 2015. One of those constitutional amendments backed by the public utilities and a group called Consumers for Smart Solar is slated to appear on the ballot this November. 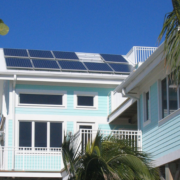 The second one, backed by the group Floridians for Solar Choice, was a more grassroots effort that failed to get the necessary signatures to trigger a Florida Supreme Court review. That proposal does share bipartisan support, as Brandes noted about his constitutional amendment. An existing ad valorem abatement for solar and renewable energy devices on residential property already exists in the state constitution. The lawmakers’ proposal opens the door for significant expansion of solar and renewable energy production on a larger scale in Florida. Once implemented by the legislature following approval in August by the voters, the ad valorem tax incentives of the amendment will begin in year 2018 and continue for 20 years. https://loriberman.com/wp-content/uploads/2016/09/solar-tea-party-split-Large.jpg 1080 1620 mdwcomm https://loriberman.com/wp-content/uploads/2017/11/Berman_Branding_StateSenate.gif mdwcomm2016-04-05 22:18:022017-11-29 19:39:57Florida Politics: "Jeff Brandes, Lori Berman, Ray Rodrigues launching campaign for solar power tax breaks"